“Everything comes to those who wait” – the words of ANA president Shinichiro Ito during the 787’s unveiling to the Japanese public at Tokyo’s Haneda Airport back in July 2011. ANA’s president is clearly a very patient man – as the 787’s launch customer, the carrier was supposed to receive the first of its 55 Dreamliners on order in 2008. However, ANA’s 787 didn’t begin commercial service until September 2011. In preparation, Boeing and the airline began service readiness validation for the aircraft in July 2011. ANA pilots, together with Boeing, flew the Dreamliner on routes from Seattle to Tokyo and Tokyo to four airports across Japan, including Osaka (Itami and Kansai), Okayama and Hiroshima. Teams from ANA and Boeing validated more than 100 procedures, including towing the aircraft, conducting fit checks of ground support equipment, staging electronic flight bag data and completing maintenance actions, among other activities. “Our teams worked well together and the aircraft performed as we expected,” said Mike Fleming, 787 services and support vice president. To further facilitate staff training, ANA’s first 787 aircraft was initially deployed on domestic routes with a high-density short-haul interior capable of carrying 264 passengers (12 business-class seats and 252 economy seats). It also performed a commemorative first commercial charter flight from Tokyo-Narita to Hong Kong. The aircraft was then used for scheduled flights on the Haneda-Okayama and Haneda-Hiroshima routes. The track-mounted seat converts into 74.5 x 25.3in bed with fully retractable armrests to provide the best possible width when sleeping, while a privacy shell is designed to counteract any disturbance from noise. Two actuators per seat provide tracking and recline functions (seat pan and legrest). A 17in touchscreen IFE monitor is integrated into the seat shell and a universal PC power source, USB port and an iPod jack are included. A generous side table on top of each side monument, in combination with individual lighting, help create an ideal work environment. There’s certainly plenty of room for laptops and papers – in fact central single seats feature two such side tables – perfect for travelling bureaucrats and bankers overloaded with files and reports. If that’s not enough, there’s also a one-piece meal table that pulls out from underneath the side monument surface. There’s even a dedicated shoe drawer under the seat – a feature first introduced on the 777-300ER. The idea was to make passengers feel more at home – removing one’s shoes before entering a house is customary in Japan – while it also ensures a more neat and tidy cabin appearance. 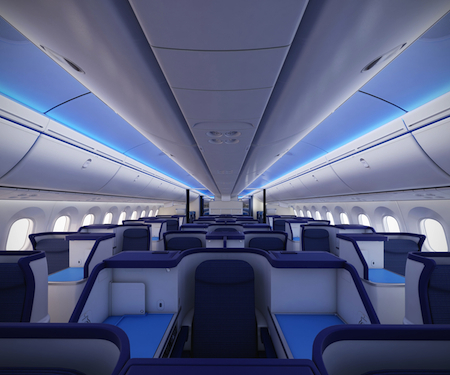 Meanwhile ANA’s short-haul 787s serving Asian destinations such as Hong Kong, China, Singapore and Bangkok feature 42 Sicma Majesty cradle-style seats in business class in a 2-2-2 configuration. Each seat is equipped with a 12.1in touchscreen IFE monitor (10.6in for first row units), power and USB dock. 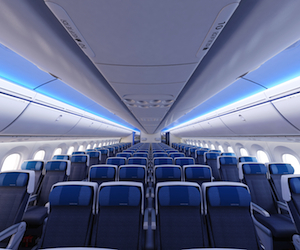 The economy section of both its long- and short-haul 787s sees Sicma’s AIRgonomic FX seating units installed. The seats feature a fixed backshell to ensure no intrusion into passengers’ living space: “We didn’t want passengers to be bothered by people sitting back,” explained Kawate. ANA opted for a 2-4-2 configuration, despite the majority of 787 customers choosing nine-abreast seating. 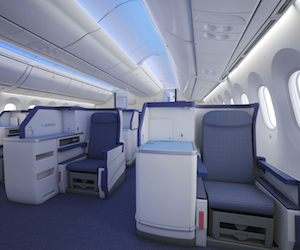 “We wanted to enhance the comfort for passengers in economy class,” added Kawate. Long-haul seat pitch is a generous 34in, and passengers get a seat-mounted 10.6in IFE monitor, in-seat power and USB port. Short-haul economy seat pitch is 31-32in with 9in seatback screens installed. Despite the delay, there’s no doubt that ANA received an aircraft with some exciting new cabin features – all fitted as standard by Boeing. 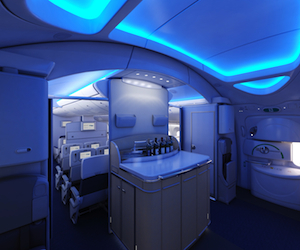 First of all there’s the Dreamliner’s 47cm tall and 28cm wide windows – 30% larger than those installed on the 767. “Their size and location give a really remarkable view of the flight,” said Tom Galantowitz, Boeing’s 787 interiors director. “One of the really key aspects is that any passenger can see out of the windows.” An electronic dimming function integrated into each window adds to the excitement: “There’s no comparison to a shade, because you can have it at a setting where you can still see through the window yet not disturb the other passengers around you,” added Galantowitz. Passengers will also welcome the more expansive overhead compartments, which are 30% bigger than those on the 777, with enough room for four standard carry-on bags. They’ll also notice the much improved cabin atmosphere – air pressure will be maintained at an equivalent altitude of 6,000ft, in comparison to 8,000ft on its previous aircraft, while humidity will also be increased. 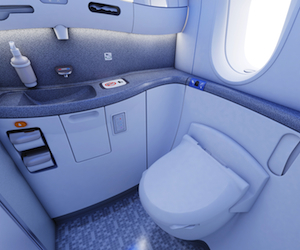 Individual touches added by ANA to the overall passenger experience include lavatories jointly developed by Toto, Jamco and Boeing that feature ‘washlet’ technology – a toilet seat equipped with a hot water washer. Such toilets are common in Japanese homes, hence the airline was keen to introduce them in flight. 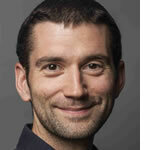 “Washlets have quite a reputation in our market,” explained Kawate.